Everyone's got their own preferred brand of toiletries like shampoo, conditioner, hair gel, and body lotion – none of which we can bring on a plane with us because of the 3.4oz liquid rule (100 ml). And if you travel like me, checking bags isn't an option, so enter travel bottles. In this post, I'm going to explain the TSA liquid rule, outline what to look for in a travel bottle, and then recommend some of the best travel bottles to choose from to help get you on that plane faster and with your favorite shampoo. If you're in a hurry and just looking for my recommendations, check out these travel bottles by Auskit, GoToob, OwlEyes, and LiquiSnugs. How big of a shampoo bottle can I bring on an airplane? The Transportation Security Administration (TSA) allows you to bring a quart-sized bag of liquids, aerosols, gels, creams and pastes in your carry-on bag and through the checkpoint. These are limited to travel-sized containers that are 3.4 ounces (100 milliliters) or less per item. 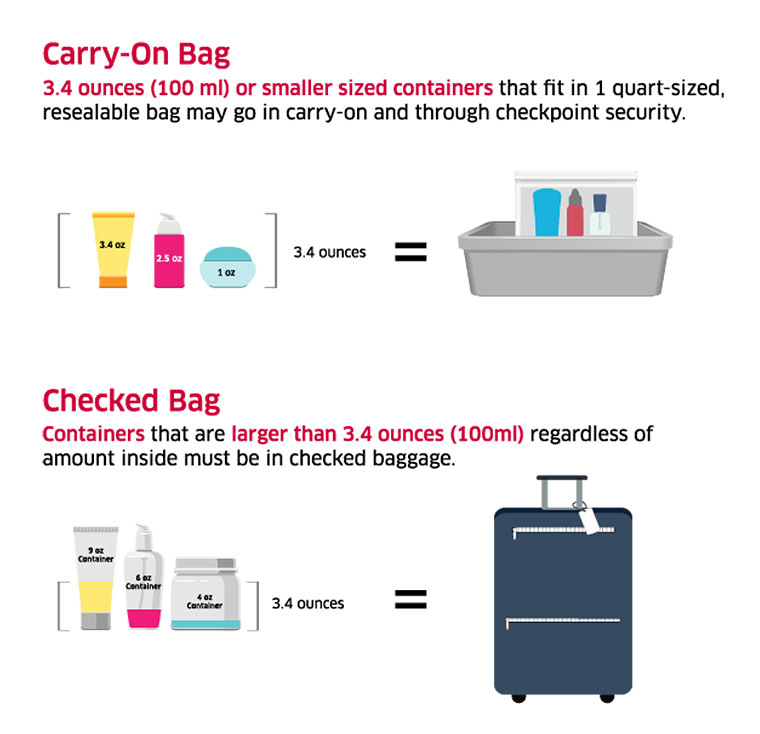 So thanks to the TSA Liquid Rule, you'll either have to buy new toiletries at your destination or bring some of your own in tiny travel bottles. Less than 3.4oz (100 ml). This should be obvious but not all travel bottles are created to be used as carry-ons – some are bigger and just labeled as “travel” – so make sure that it's TSA Approved for carry on travel so you don't have to throw it away at the security gate! Multi Colored Pack Otherwise you end up with four of the same colored bottles and you accidentally shampoo with hair gel and condition with soap. Multiple colors can help you remember which liquid is which. Leak Proof That should go without saying, but I'm going to say it. The worst thing that can happen on a vacation is when toiletries leak all over everything. Okay, well, maybe not the worst thing that could happen – but it's worth spending an extra dollar or two on a good set of leak proof travel bottles to avoid that issue all together. I did the research, read the reviews, and ordered enough tiny bottles to travel for the rest of my life – and through this extensive research, these are the travel shampoo and conditioner bottles that I recommend. In first place is this set of 4 travel bottles by Auskit which comes with a multi-clip lanyard for transporting your travel bottles to and from the shower and a clear travel case for a double layer of protection against leaking all over your toiletry bag. The bottles themselves are leak proof, but the additional case helps ensure a dry bag in the event of human error (like not completely sealing one of the bottles). The bottles themselves hold 3.3oz which is about the maximum size bottle on the market which allows you to carry as much liquid as possible on the plane, and they're made from silicon which is what we're looking for. The bottles also have a twistable ID window which displays text to identify what's inside the bottle. You can rotate between: Soap, Sun, Lotion, Cond., Shamp., and Blank. 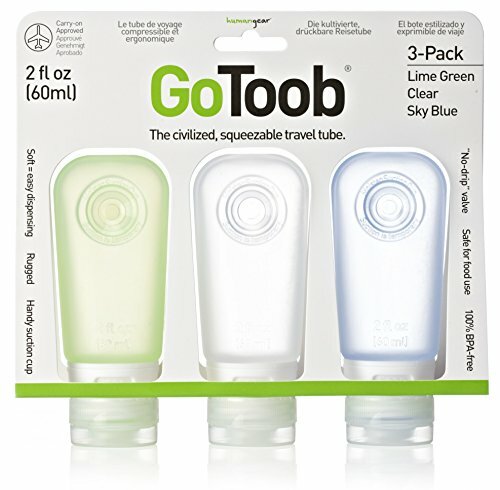 If there was a name brand in the travel bottle space, the title may go to Humangear's GoToob Travel Bottles – the original, patented soft travel bottle. These silicone bottles are made in America and are even FDA Approved for food (just in case you decide to use them as travel bbq sauce bottles). These are a bit smaller than the AusKit bottles at only 2 oz, but that might be right up your alley depending on how long you'll be traveling. They come in a 3 pack of multi colors which you can choose between Clear/Green/Blue or Clear/Orange/Red. Third on the list is both functional and cute. 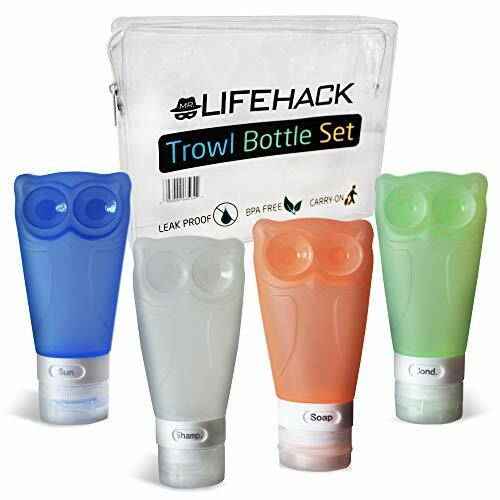 These OwlEyes Suction Cup Travel Bottles by MrLifeHack have dual suction cups so that you can conveniently attach them to the shower wall, which are intentionally placed to look like the eyes of an owl! They are also leak proof and have a twistable ID window to display the text label of what's inside. And did I mention they look like little baby owls? 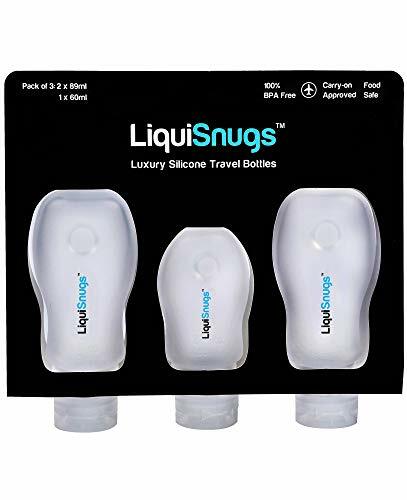 Number four on the list is LiquiSnugs Travel Bottles which come in a three pack that includes two 3oz bottles and one 2 ounce bottle. They also come with adjustable text labels, suction cups, and are designed with a leak proof lid. That list of four should be enough for you to find a suitable leak proof set of travel bottles for your next trip, but what if you're looking for something a little bit cuter? 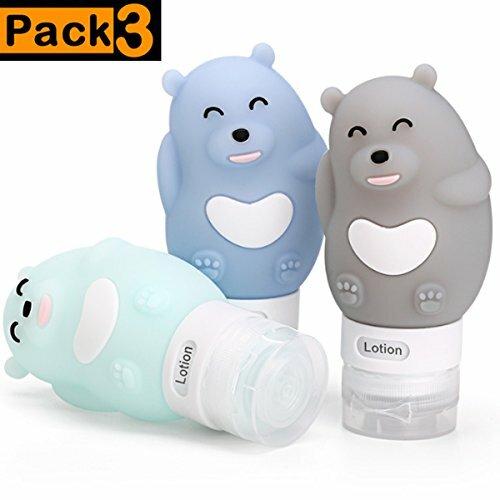 If so, you'll enjoy these top 5 most adorable travel bottles – which might be a fun way to get your kids to take a bath on your next trip. #1 These little soapy penguins! You can pretend like the polar ice caps are melting and have a blast in the bath with these little soapy penguins. #2 They took a bath. They took a MONSTER bath! #3 Tutti frutti wash your booty! 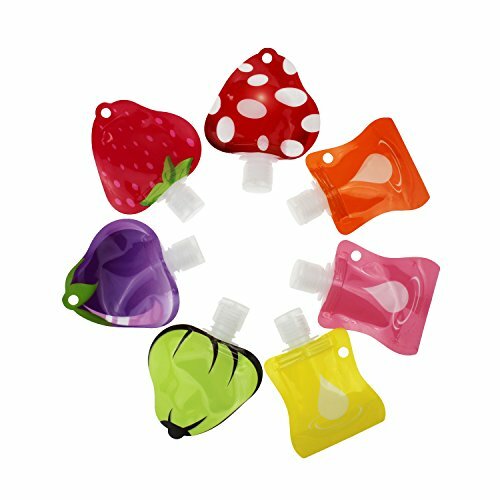 Keep it fresh and fruity with this travel set of 7 fruit shaped travel bottles. Set of 7 travel bottles, perfect for shampoo, conditioner, body wash, lotion and more. Large opening for easy refill with leak-proof cover. Love bears? Check out these Berenstain beauties. I guess they don't have to be a character anyone's ever heard of before to have fun with them! These are sold individually as a horse, a donkey, and a hippo (I think). 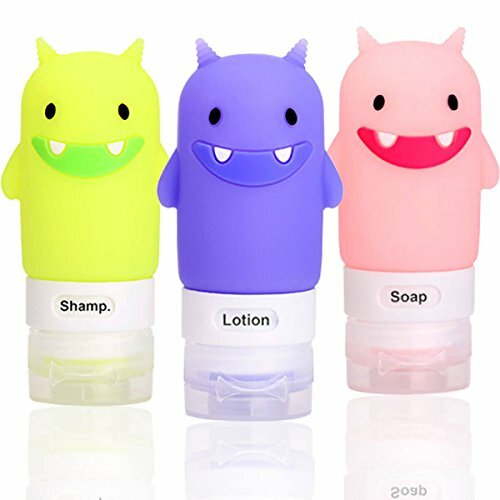 What are your favorite travel toiletry bottles? What'd I miss that I should add to this list? Drop a comment below with the link to your favorite brands and tell me why you love them. Stay clean my friends! Want to learn more of my hair secrets? Check out my articles about best sulfate free shampoo bars to discover how you can get through TSA airport security while still using high quality shampoo and conditioner. Like this lost and want to share it to your favorite travel board? Use my special Pinterest friendly graphics below. PreviousLa Punta, Callao Peru: This Beach Rocks!